Tell A Friend About Balancing the Sword - In Fact, Tell Lots of Friends! Thank you for your support. 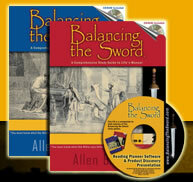 You can be confident that Balancing the Sword will aid your family and friends at getting into the Sacred Text. The e-mail addresses that you submit will NOT be given to others. NOTE: If you wish to send this message to more than one person, enter your name as the sender and the recipient. The letter will come to you. Then, you can forward the email to your friends.